When Lieutenant Governor Janice Filmon delivers the throne speech November 21, a plan for poverty reduction should top the government’s priority list. The Province has promised a plan by next year’s budget and Manitobans are waiting for details. Poverty comes in many forms, most of them hidden from public view: an empty fridge at the end of the month; a coolness in the room, because hydro rates have gone up and income hasn’t; a mom juggling between her threadbare budget and her child’s unpredictable growth spurts. Poverty reflects the impossible choice of asking not what can be done without, but what is essential that will nonetheless be sacrificed. Poverty weighs on those who live with it, limiting opportunity and health. It makes people more susceptible to disease and shortens lifespans. When everyday survival is a consuming effort, people have few resources left over for taking steps to find jobs, or improve their education and training. Poverty becomes a cycle that is difficult to escape and too often becomes intergenerational. Collectively, we make choices also, as a society and through our governments, about how we will address poverty. We need a comprehensive plan that looks at the issue systematically and includes targets and timelines for reducing poverty. Solutions must be interrelated, based on evidence of what works, and informed by the experience of those who have lived with poverty. Community organizations have developed a blueprint for such a plan with 50 recommendations in targeted areas including: food security, childcare, income supports, housing, education, health, training, quality jobs, and other social services. The View From Here was endorsed last year by over 100 groups and should form the basis of a provincial plan. According to provincial statistics, 130,000 Manitobans live under the Market Basket Measure (MBM) of poverty, the level that Statistics Canada uses to calculate a bare level of basic necessities. For Winnipeg, the MBM was just $17,469 in 2013 for a single individual. Unfortunately, many Manitobans who rely on Employment and Income Assistance (EIA) subsist far below this level. A single adult on EIA is at only 53 per cent of the MBM. This means she has only half the amount she needs for the basic necessities like food, shelter, clothing and transportation. An individual on disability is at only 68 per cent of the MBM, even though people on disability may often experience higher costs for equipment, health and other special accommodations. Improvements in Rent Assist over the past two years have helped make shelter more affordable. However, there has been no increase since 2004 in the EIA basic needs budget, which covers necessities other than rent, while costs for food and over essentials have skyrocketed. Families with children live closer to the poverty line, thanks in large part to federal child benefits which have recently been enhanced. A single parent with two children on EIA is at 92 percent of the poverty line, while a two parent, two child family is at 87 per cent – still well below what is needed for raising a family. Ultimately our goal must be to lift all Manitobans above the poverty line, however we choose to define it. In the short term, we must do more to get those in the deepest poverty closer to that level. 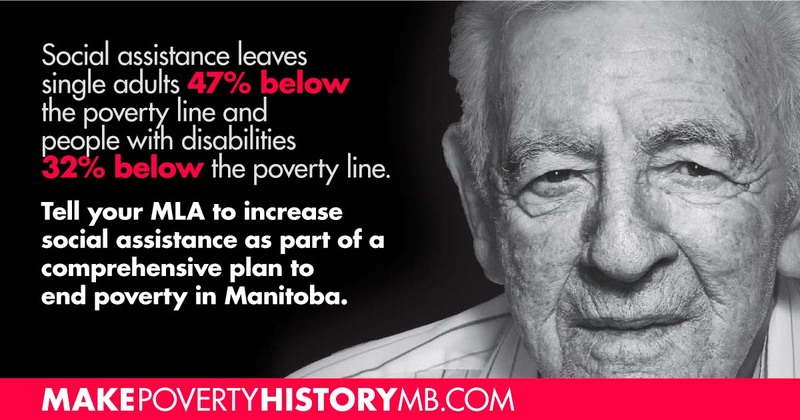 Make Poverty History Manitoba launched a campaign this week calling on the Province of Manitoba to increase the basic needs budget to bring the total incomes of all Manitobans up to at least 75 percent of the MBM in 2017, as part of a comprehensive plan. This is an interim measure to deal with crisis levels of deep poverty for about 26,000 Manitobans that would cost approximately $52 million annually. The campaign, launch on November 16, has been endorsed by more than 90 organizations from across the province. Eliminating poverty will require investments, but these make economic sense. Manitoba has run away costs in services correlated with poverty like Health, Justice, and Child and Family Services. According to the Winnipeg Street Census, a point in time count of people experiencing homelessness, almost half had spent time in foster care or group homes. The health costs of poverty are astronomical: diabetes costs alone are expected to rise to over $500 million by 2020 under current trends. Our existing approach to poverty is unsustainable. An alternative is possible. When we provide money to low income people, every dollar is spent in the local economy. When benefits are portable and follow people if they are able to secure paid employment, we tear down the barriers that keep people in dependence. As a result, individuals will have the tools they need to succeed, and our communities will be strengthened. If we invest in people, the returns come back to benefit all of us. However, it must start with a plan. Josh Brandon is chair of Make Poverty History Manitoba, a community animator with the Social Planning Council of Winnipeg, and CCPA-Manitoba Research Associate. For more information, visit: www.knowpoverty.ca.